Join us on Thursday nights at Goldcoast Ballroom (see address on our Contact page) for our Group Class in International Standard Ballroom Dancing. We cover a different dance each month. The class usually starts at 8:00 p.m., but check our Calendar or contact us before coming for the first time, just to be sure. The $15.00 cost of the one-hour class includes a one-hour practice session following the class, in which we practise what we have explained in the class with the students and the students dance with each other. You do not need a partner to join. Both singles and couples are always welcome! Our social dance classes will help you feel at ease on any dancing occasion. Whether a formal dinner dance, wedding, holiday party, or sea cruise is in your future, we will show you how to navigate the dance floor with style. Among the dances included are Swing, Cha-Cha, Foxtrot, Tango, Waltz, Salsa, Rumba, Samba and Merengue. Free class, usually in one of the Latin, Rhythm, or Social dances. The class usually starts at 7:00 p.m., but check our Calendar or contact us before coming for the first time, just to be sure. Both singles and couples are always welcome! Private instruction is the fastest and most effective way to learn to dance. One-on-one with an instructor allows for individual attention and learning at your own pace. The teacher is focused on you and you’re in total control of which dance style you wish to learn. In a private lesson you will learn detailed patterns, posture, timing, how to lead or follow, technique, and style. We will guide you every step of the way, making it fun and easy. Personalized Dance Programs are available. Through direct goal setting and individually customized lessons, we offer ultimate possibilities in partner dance. Group classes are a great way to get started or to improve your dancing skills in a fun and social learning atmosphere. Our group classes are small in size and large in personal attention. You do not need a partner to join. Both singles and couples are always welcome! On Tuesday and Thursday evenings, we teach group classes at Goldcoast Ballroom, and on Wednesday afternoon and evening, we teach classes at The Plaza Ballroom (see addresses on our Contact page). Check our Calendar or contact us for an updated schedule. 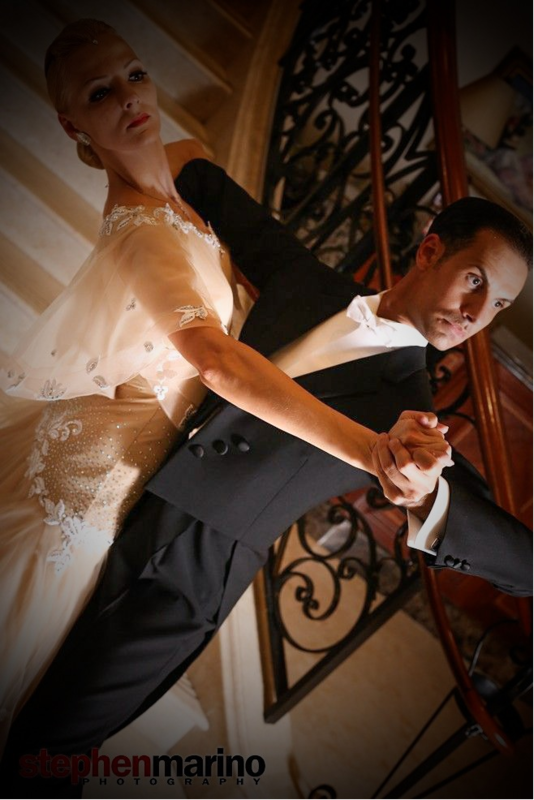 Dancing your first dance as husband and wife is a memory you will cherish for years to come. We can provide you with simple, practical Classic Wedding instruction to your favorite song or we will take you beyond your expectations with special patterns that will surprise and delight your guests! See our Calendar of Events for the schedule of classes we will be teaching each month. For more information, or to book a private lesson or group class, please feel free to contact us. Our contact details are found on the Contact page of this site.